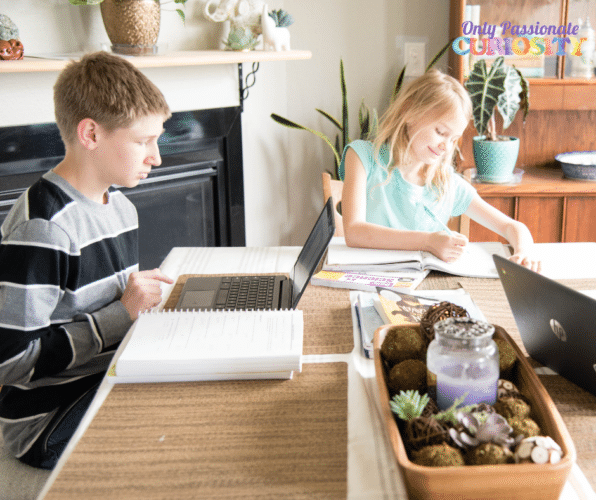 Balancing homeschooling multiple children while also managing your home, meeting work obligations, and maintaining your sanity can be a challenge. 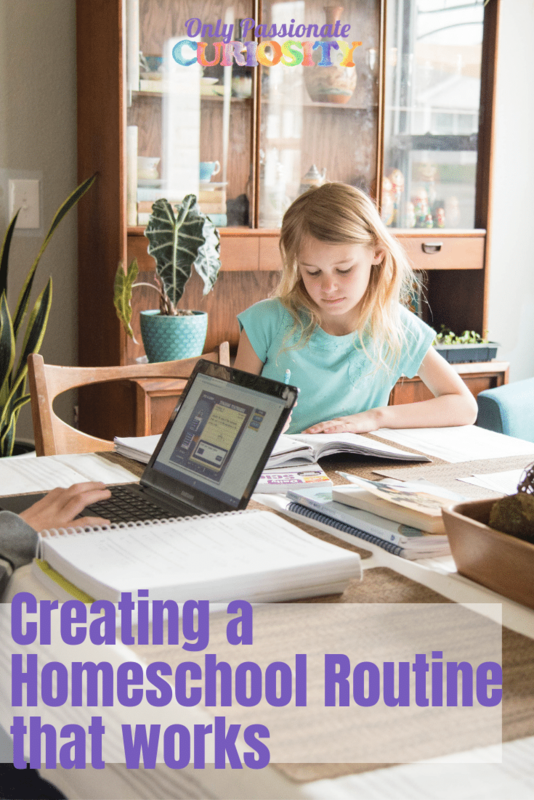 Here is how you can build a homeschool routine that works for you. This post is sponsored by Teaching Textbooks. 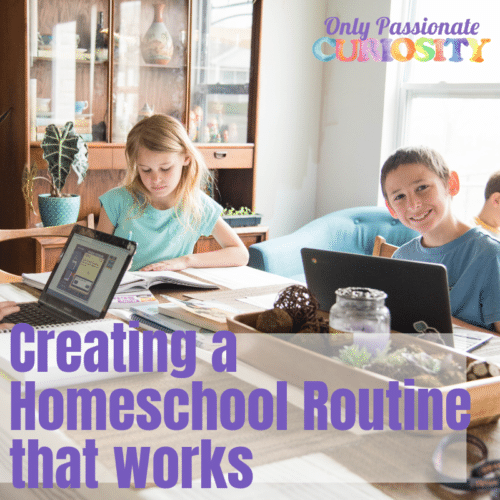 Their curriculum can be almost completely hands-off for you as a homeschool teacher, clearing up time in your day so you can create a routine that works. Check out their options for elementary through high school math today. A free trial is available for you to try teaching textbooks before you buy. If you are reading this post, I am assuming something about you. I am assuming that your current routine (or non-routine) isn’t working for you anymore. Maybe you never seem to have the time in the day to get things done. Maybe you are floating around aimlessly and don’t seem to ever make progress on your to-do list. Maybe you never made a to-do list at all, and you’re feeling stressed about your lack of a daily plan. 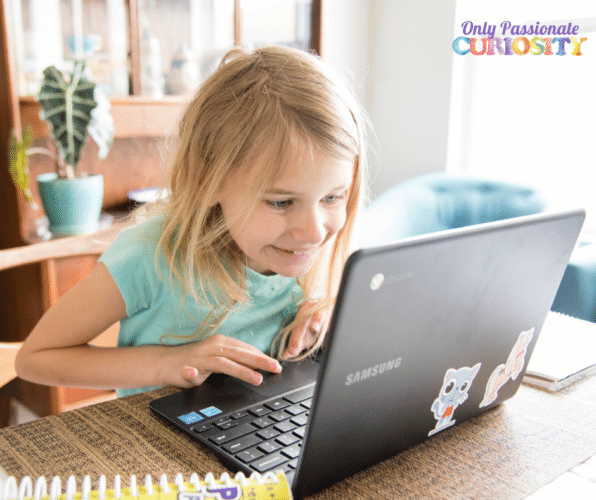 Wherever you are, take a moment to consider what your current homeschool day looks like. Where are your sticky spots? What leads you to feel stressed? What goes very well? Keep this in mind as you move forward in making a plan. Mommy guilt. It’s really an ugly thing. It seems like no matter how hard we try, something is neglected or forgotten. I don’t want you to go to bed at night thinking you didn’t do enough or worrying that your kids are falling short because you didn’t find the time for every lesson you had in your planner. Step one for finding a routine for you is forgetting the mommy guilt. Think about all the things you think you should do or have to do to be a successful homeschooler, and then FORGET them. No two homeschools look the same. No two children have the same needs. No two parents have the same skills or strengths. For example, if you recently went to a homeschool conference and walked away thinking that you have to follow the classical model of learning, or you have to be hands-on and teach every subject yourself, or you have to be screen free in order for your kids to be smart, or you have to learn a foreign language…. Go ahead and tell whoever put that idea in your head that they are wrong and not the boss, and then FORGET about it. You don’t have to do any such thing. You have to figure out what your homeschool is meant to be, and do that instead. It’s more important to focus on what you want out of your homeschool day. What would make you feel successful? What priorities do you have for your kids? I want my kids to have confidence in themselves as people, and as learners. I want them to know how capable they are. I want them to know how smart they are. I want them to be unafraid to tackle hard things. 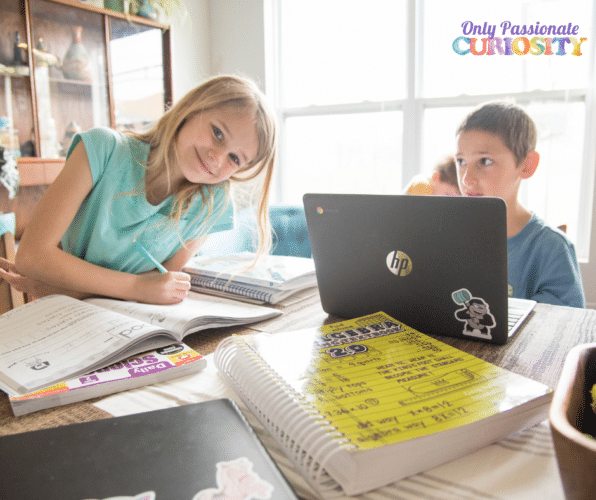 I want my kids to be curious and resourceful. I want them to ask questions about the world around them, and when they are stumped, I want them to know where to look for answers. I want them to learn how to learn. I want my kids to be able to communicate their ideas, wants and needs clearly and without reservation. I want my kids to enjoy their childhood. I want them to slow down, to play outside, to fiddle with things, to create, to explore and to experience the world around them. I want my kids to be good, kind, loving, moral people. I want to leave doors and windows open for my children so as they grow and decide who and what they want to be in the future, they will have the options, resources, and confidence needed to chase their dreams. When I write this list and look at it rationally, it doesn’t make much sense for me to lose sleep because once again we skipped over the grammar lessons about sentence diagramming, and we never got past the third week in their Latin curriculum, and I am not sure if any of them know how to write a proper bibliography. It does make sense for me to worry that maybe Little Miss is falling behind in reading and writing (see desire #3 for her to be able to communicate easily) and that maybe Doodle needs to do some extra work on his math facts (desire #6, I’d like him to be college prepared in case he chooses to go that route). Having a clear list of your priorities can help you determine how to spend your time and how to build a routine that works. Do this step first, and repeat this step often. Once you have your priorities set, it’s time to take a realistic look at what you must do in each given school day. Make a list of the tasks and make a realistic guess at how much time each task takes. If you have multiple children, make a list for each child. Include things like chores, self-care (do you need 30 minutes for yourself to exercise each day to stay sane, or an afternoon mom-only break to watch a sitcom, include that), routine appointments (therapies, co-ops, park dates). Your list may seem impossible when you are done making it. That’s normal. Move on to step three. First things first, look at your list, then set it down, and re-read the priorities you set for yourself and your home. Get these firmly in your mind, and look back at the list you made. Cross off any tasks that do not fit with your priorities or feel like things you were told you “must do” (but don’t actually believe they are important). Give yourself permission to say no, to quit, to withdraw from an activity or otherwise eliminate the extra items from the list. Highlight items that are “non-negotiables” – things that are SO important that they must happen every single day for you to feel successful. Try to limit this to three items per child, and three items for yourself. Rank the remaining tasks in order of priority. The most important remaining task for each person is task #1. If you end up with more than 7-10 tasks, start seriously considering if task #11+ is something that really needs to be a part of the routine. At this point, each person in your family should have a top three task list, plus an additional list of the important (but not non-negotiable) tasks in order of priority. Look at each child’s list, and at your list. You only have so much time in your day. If you have more than one child working at different levels, you’re going to need to find places and ways for your kids to work independently. For each of my children, I set ONE main priority for the year. Typically, this priority is one of their non-negotiables. This year, my priority for Little Miss is learning to read. My priority for Bug is to get him writing without drama. My priority for Doodle is to work with a positive attitude. I tend to teach the priority subjects myself and find ways to either outsource or get the kids working independently on their other tasks. With these priorities in mind, figure out where you can step out of the equation. There are many options on the market for your child to learn independently, but my very favorite time-saving program is Teaching Textbooks. You want to look for programs that are high quality and offer feedback and teaching that supports your student. Teaching Textbooks have complete lectures, sample problems, and solutions so my kids get a better math education than they would if I was teaching (because let’s face it, advanced math never was my jam) and I am not spending more than just a second to check their grades at the end of the lesson. Teaching Textbooks offers a free trial so you can test this program out with you kids before you buy. Once you figure out what you can take off your plate, either by eliminating the requirement, outsourcing or by fostering independence with your kids, you’re ready to create your routine. Now that you have your lists in front of you, you’re ready to create a routine that works. I like to work in chunks of time. We have a morning routine, a lunch routine, and an afternoon routine. You’ll want to focus on YOUR time, and then work the kids around what you need to be doing. Try to work your top three tasks into the first part of your day, and the less important tasks later in the day, that way, if things get out of hand and tasks start falling off the list, it’s not as much of a crisis. The key is finding a place for everyone to be, keeping independent learners within the same area (so you can supervise and keep people on track), and make sure that you only need to be working with one child at a time. Teaching Textbooks is my favorite time-saving tool, and today they are graciously offering one lucky reader a subscription to their new 3.0 program for one child. Enter to win using the giveaway widget below. The winner will be informed via email and will have 48 hours to claim their subscription.